Is another Mellabration in the works? Carmella pulled off what many in the WWE Universe thought was impossible at WWE Money in the Bank, defeating Asuka to retain the SmackDown Women’s Championship. The Princess of Staten Island had a shocking assist from the returning James Ellsworth, who helped her pick up the victory. How will the champion follow up her big win? Is another Mellabration in the cards? Will Carmella have to deal with Asuka, who will surely be out for retribution? Find out tonight on SmackDown LIVE at 8/7 C on USA Network! WWE Smackdown Women’s Champion Carmella vs. Asuka. Carmella was all confident early on and was great at playing her role. She went for a kick but Asuka caught it. Asuka spun her around but was slapped by the Champion, who said she wasn’t scared of her. Asuka didn’t like that and caught her with a series of kicks in the ropes, then knocked her off the apron to the floor with a running hip attack. Carmella demanded her title belt and said she was the Champion and would do what she wanted. She acted as if he was going to walk out but was caught with a knee strike off the apron by Asuka. They battled outside on the apron near the ring post. Carmella pulled Asuka into it, stunning her, then tossed her into the ring. That was enough to score a two count. Carmella locked in a cool submission hold, trapping Asuka’s arm. Carmella was really vocal mocking Asuka and was great at it. Asuka fought her way to her feet, reversed and went for the Asuka Lock. Carmella ducked a spinning backfist and kicked Asuka in the gut, then locked in a front facelock. Asuka went to the ropes but Carmella kicked the ropes to stun her, then avoided a missile dropkick. Carmella’s leg was still snatched into a leg submission and the Smackdown Women’s Champion grabbed the ropes to break it. Asuka continued to build momentum and got angrier with every strike she was hit with. She finally exploded with a dropkick and a German suplex. Asuka nailed a hip attack for a two count. Asuka charged the Champion, who dropped down and pulled the ropes open, causing Asuka to crash down to the floor. Asuka returned to the apron but was attacked and kicked back down to the floor off the apron. Carmella hit a dive to the floor and covered Asuka a two count. Asuka made a comeback when someone dressed like her came from under the ring. Everything stopped as Asuka stared at this person. Carmella rolled her up for a two count. Asuka kicked up and nailed her with a kick. She turned her attention to the masked person, who revealed himself to be…JAMES ELLSWORTH. Carmella kicked Asuka in the back of the head and scored the pin. Your winner and still WWE Smackdown Women’s Champion Carmella! Carmella is getting ready for her match in the make up area. Renee asks Carmella about possibly facing Asuka during tonight’s match and if she is concerned. Carmella says Renee does not remember seeing her leaving Asuka laying in the ring. She is not concerned about Asuka. Charlotte beat Asuka and she beat Charlotte twice. She is not concerned. She is not concerned about anyone. Becky Lynch, Charlotte Flair, Naomi, Lana, and Asuka should be concerned. Asuka should be scared. We are back and Renee Young is in the back with Big Cass. Cass tells the WWE Universe about his day. He appeared at the Memphis County Fair for the opening of their new roller coaster. He pretended to smile and took some pictures. Then he took his money as well as a souvenir. It is a height chart for a roller coaster. Cass says one person does not meet the height requirement for the ride and that person is Daniel Bryan. Cass said a good big man will always beat a good little man. That is what will happen at Money in the Bank. It will not be a roller coaster or the bumper cars. It will be a freefall drop. If Daniel Bryan tries to come up to his level, he will come crashing right back down. Carmella makes her way to the ring and she has something to say. She tells everyone to get on their feet and shower her with the praise she deserves as the Smackdown Women’s Champion. They boo her and she says tonight is not about her. It is about her opponent at Money in the Bank, Asuka. She says she felt like everyone deserves to know the truth. Asuka is not who you think she is. We have a video package for Asuka. Carmella says that Asuka was incredible. She was poised and dangerous. Remove the mask and let’s reveal this truth together. This is the real Asuka. We take a look at Asuka’s match against Charlotte Flair at Wrestlemania. Then we see Asuka’s debut on Smackdown and her loss in a tag match. Carmella says that was painful to watch. The truth is that Asuka’s loss at Wrestlemania shattered her and she has not been the same since. Carmella says she has no fear. Asuka is no longer undefefeated. She is defeated. It used to be Nobody was ready for Asuka, but now everyone is ready for Asuka. Asuka’s music plays and it shuts up the champion. Asuka makes her way to the ring. Sonya says that Mandy did what she was supposed to do, she left just enough of Asuka for her. Tonight, it is her turn. Carmella says it is Sonya’s turn but who will Asuka face tonight? Before Asuka can choose her opponent, Paige makes her way to the stage. Paige says no one speaks for her. As far as she remembers, she makes the matches around here. Asuka has unfinished business with both ladies so Asuka gets to choose. Asuka takes the mic and she wants both. Paige makes the match official. SmackDown Women’s Champion Carmella caught the WWE Universe off-guard on Monday when she promised to expose her challenger at WWE Money in the Bank, Asuka. What kind of dirt does The Princess of Staten Island have on her opponent? 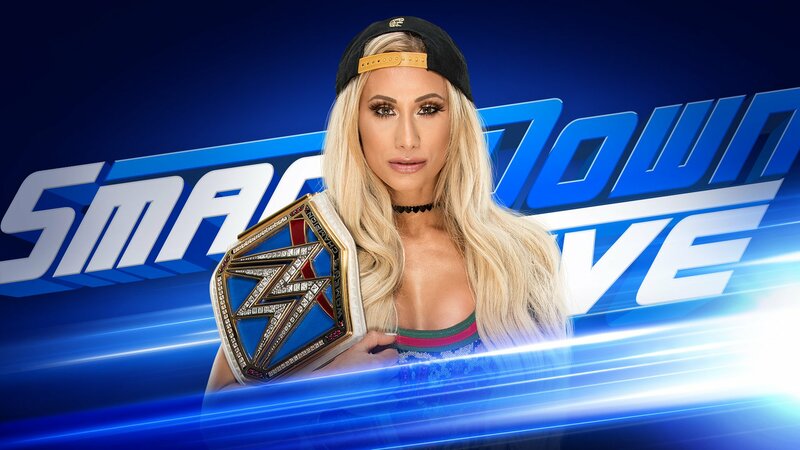 Could Carmella turn the tides of this rivalry before their huge title match in Chicago? Find out tonight on SmackDown LIVE at 8/7 C on USA Network! We are back and Carmella makes her way to the ring to join the announcers on commentary for the next match. Sonya Deville attacks Asuka on her way to the ring. Asuka makes her way to the ring and she wants the referee to ring the bell to start the match. Mandy runs Asuka into the turnbuckles and punches her. Mandy with kicks in the corner. Asuka misses a punch and Mandy grabs Asuka by the hair. Asuka with kicks but Mandy with a reverse exploder for a near fall. Mandy gets another near fall. Mandy with a Japanese stranglehold. Mandy with a drop kick. Mandy with a knee for a near fall. Asuka with a forearm but Mandy with forearms to stop Asuka. Mandy with a cravate on Asuka and she adds a modified abdominal stretch. Asuka with elbows to escape and she gets a near fall with a back slide. Mandy with a sit out gourdbuster for a near fall. Mandy goes for the butterfly buster but Asuka escapes. Asuka avoids a knee and hits a thrust kick. Asuka and Mandy exchange forearms. Asuka with strikes and kicks to the chest. Asuka with a pop up knee and she hits a sliding kick to the head. Asuka with a hip attack into the corner and she goes up top. Asuka with a missile drop kick and she gets a near fall. Asuka misses a hip attack and gets caught in the ropes. Mandy with a clothesline. Asuka with a victory roll for a near fall. Mandy with elbows to block the Asuka Lock and she leans back to get a near fall with a bridge. Asuka applies the Asuka Lock and Mandy taps out. After the match, Carmella goes into the ring to show Asuka her title belt. Carmella has an Asuka mask on and she is asked about facing Asuka. Carmella acts concerned that there is an expiration date on her title, and she laughs. She says everyone is waiting for her to slip and fall. She says she is not afraid of Asuka. Charlotte destroyed the myth of Asuka and Carmella reminds everyone that she beat Charlotte twice. That makes her twice as good as Asuka. Asuka can use all of the smoke and mirrors because Asuka should be afraid of her. What can ruin any good Mellabration? Well, The Empress of Tomorrow coming for your title is a solid start. At WWE Money in the Bank, Asuka aims to unseat SmackDown Women’s Champion Carmella at the same pay-per-view where the current titleholder’s march to championship glory began one year ago. 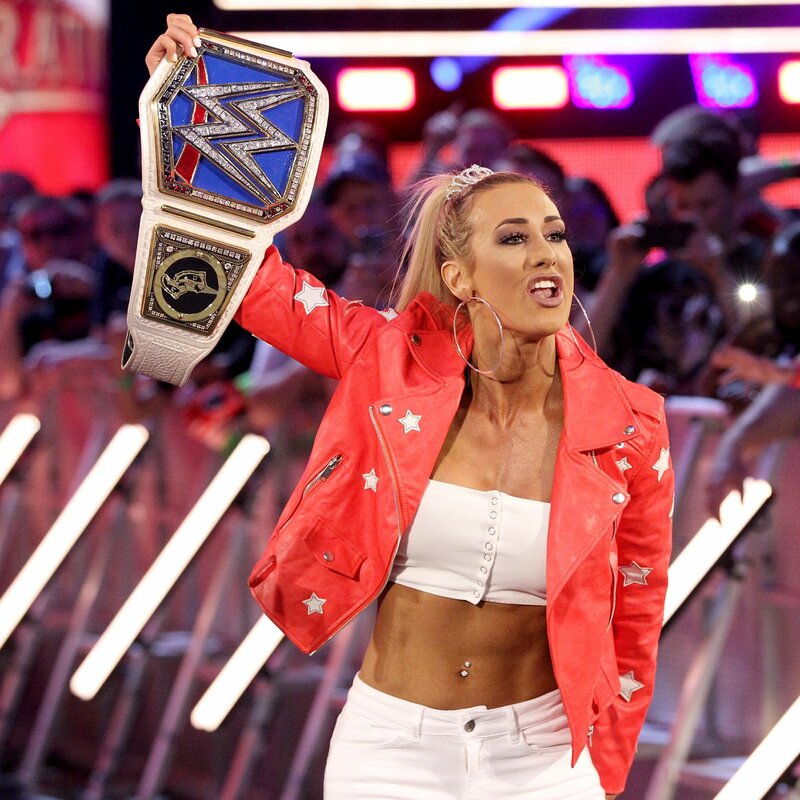 Carmella has always been about opportunity, something that served her well when she won the first-ever Women’s Money in the Bank Ladder Match last year and secured a Women’s Championship opportunity whenever she wanted. After the IIconics assaulted Charlotte Flair on the April 10 edition of SmackDown, she cashed in her coveted contract and pinned The Queen for the gold following a wicked kick to the face. Her success was further amplified by her victory over The Queen in their rematch at WWE Backlash. The Staten Island Princess may scream at a fever pitch, and she may be outspoken, but she is undoubtedly armed with the ability to remain on top for many Mellabrations to come. It remains to be seen, however, if she is ready for Asuka. Prior to WrestleMania, The Empress of Tomorrow stood undefeated for well over 900 days. She won the first-ever Women’s Royal Rumble and the groundbreaking WWE Mixed Match Challenge Tournament alongside The Miz. She still stands as the longest-reigning NXT Women’s Champion in history. On The Grandest Stage of Them All, Asuka fell to Charlotte in an extremely hard-fought title bout, but she remains as dangerous as ever. And now that she has come to SmackDown LIVE, she is ready to claim the blue throne as any cost. The dynamic Superstar possesses an arsenal like few others, and if Carmella is not careful, she will possess her title as well. Will Mella be Money? Or will the co-branded pay-per-view be all about Asuka? Find out at WWE Money in the Bank, Sunday, June 17, at 8 ET/5 PT, streaming live on WWE Network! We see Carmella’s dressing room door, and we’ll get her royal Mellabration…NEXT! An old dude in colonial-era attire comes out to introduce the woman who beat Charlotte Flair twice, the Smackdown champion of all women, god save CARMELLA! A trio of royal guards with the big furry hats come out, with one of them holding the Women’s Title belt on a pillow, then Carmella comes out, grabs her belt, and skips down to the ring to address her public. She wanted to give the fans the opportunity to show her how much they love her, so for the next ten seconds or so, they can feel free to shower her with as much love as she deserves for being the first Ms Money In The Bank and Women’s Champion. The fans boo her (I just noticed she has a tiara hair clip, which is a nice touch), and she asks what’s wrong with them for mobbing outside a hospital to catch a glimpse of a baby and they don’t show the Princess of Staten Island the respect she deserves. She orders them to bow down before her, and a few do. She says the people remind her of the women on the Smackdown roster because none of them think she’s good enough or deserve to be Women’s Champion, but guess what, not-so-great Britain? Mella is money, and Mella is champion, and that makes her better than each and every one of the fans in the audience. She’s better than Charlotte, Sasha, Becky, Nia Jax, Alexa Bliss, and even Ronda Rousey! She’s even better than Trish Stratus and Lita combined! Oh wait, here comes Paige, and Carmella assumes she’s out here to show her people how to properly treat a princess. Paige says it’s great to be home, but she does have something to say to Carmella, and that’s that she has a royal proclamation of her own: her opponent at Money In The Bank. Carmella says she isn’t putting her title on the line at MITB, but Paige says she is, and it’s going to be against THIS WOMAN! She motions to the entryway, and out comes Asuka! Asuka takes the mask off and smiles at Carmella, who grabs her belt, yells at Paige, and heads for the hills. Carmella’s Money in the Bank contract cash-in on Charlotte Flair on the SmackDown LIVE following WrestleMania 34 was the culmination of four challenging years for The Princess of Staten Island. Starting out in NXT as a manager, many doubted she would reach such heights after her associates were called up two years earlier. As you’ll see in this exclusive Q&A with Princess Mella, the doubters only fueled her desire to accomplish everything she wanted – by any means necessary. WWE.COM: After WrestleMania 32, you were on your own in NXT for the first time. What was that like? CARMELLA: To be honest, I was super devastated. I didn’t know what was going to happen with my career now that I was separated from Cass & Enzo. They were on Raw, and all I ever knew in NXT was being with them. Triple H told me it was because he saw me on my own and I could be fine and successful on my own, but honestly, I was a little scared. I wasn’t sure what the next step would be for me, but I knew no matter what, I had to be successful and put in as much work as I possibly could to improve and get better and make it on my own, to prove to everyone that I was more than just a manager, that they made the right decision keeping me on my own. WWE.COM: Let’s fast-forward a little bit to the 2016 Brand Extension and the WWE Draft. What was it like on that night? CARMELLA: Watching the Draft, we were all at the Performance Center. I had no idea what was going to happen. You see all of your colleagues getting called up and we’re watching it happen on this big screen. All you can do is hope that you’re going to be one of them. And then it came down to the very last pick, and I thought “Oh God, I can’t believe I’m not going. This is devastating.” And then it was me! WWE.COM: How did you feel after that? CARMELLA: Immediately, I thought it was so exciting. I get to go to the WWE roster and be on SmackDown LIVE. And, it was only about three months after the boys had gotten called up on the night after WrestleMania. To me, it was so exciting that after just a short time of being on my own in NXT, I proved that I could do this on my own, and I got drafted to SmackDown LIVE. WWE.COM: Did being the last pick in the Draft motivate you at all? Did you want to prove that you should have been taken higher? CARMELLA: Absolutely! I love that I was the very last draft pick. A lot of fans and other people looked at it like “You’re excited? You’re the last draft pick, almost an afterthought.” In my mind, I was like “OK, I’ll show you who the afterthought is.” It lit a flame under me, just like when I didn’t go up with the boys. It was another motivating factor for me to do my very best and prove to everybody that I was going to do big things, become champion and do all the things they said I can’t do. big things, become champion and do all the things they said I can’t do. WWE.COM: How did you feel about your early days on Team Blue? What was adjusting to life on the WWE roster like? CARMELLA: When I was in NXT, I never wrestled on a TakeOver. I didn’t have too many high-profile matches, I probably wrestled about 10 matches in total on NXT TV, including the one championship match against Bayley, which was so much fun and my favorite match in NXT. But, aside from that, I didn’t have much experience. I spent most of my time being a manager. To get up to SmackDown LIVE and have my first match on live TV, I was so nervous. I think the way my first year on SmackDown went was perfect for me. I eased my way into things slowly. I didn’t get these crazy opportunities right away. I wanted to continue to work and improve on live events and figure myself out. I had to make some changes when I split from the boys, but I didn’t let it get me down. I used it as fuel for the fire to get better and reinvent myself, which is how I got to be the moonwalkin’, trash-talking Carmella you see on SmackDown LIVE every week. WWE.COM: Your first major rivalry on SmackDown LIVE was with Nikki Bella. Did that give you a taste of what it takes to make it on the main roster? CARMELLA: I was nervous, but I knew I had to take the opportunity and run with it. The fans loved her, so it was easy for me to get the WWE Universe to hate me. I learned a lot, but I wouldn’t have changed anything about it. We had a great rivalry, and it gave me the opportunity to get on the microphone, which was so much fun. It was awesome to be able to work with her. WWE.COM: After that, you took one step closer to the SmackDown Women’s Title, albeit in an unusual way. What did you see in James Ellsworth that made him useful to you? CARMELLA: He was in the main event picture, wrestling AJ Styles and Dean Ambrose. I knew no one would ever see that coming, me using him to get where I wanted to be. That made it fun because no one expected it, and because none of the women have a male manager. It presented a lot of cool opportunities, like wrestling John Cena & Nikki Bella, and my victory in the Women’s Money in the Bank Ladder Match, which had everyone up in arms. WWE.COM: Let’s talk more about the Women’s Money in the Bank Ladder Match. What did it mean for you to be a part of that match? CARMELLA: It means everything, we made history. To be able to be a part of it was an honor. I’m not going to lie: I was really scared and a little nervous when they told us it was going to happen. They pulled us into a room and told us, but said, “We need to make sure you’re all on board and willing to do it because it’s going to be dangerous and tough.” Everyone was nodding their head yes, including me, but inside, I’m thinking, “Oh my gosh, I’m the smallest girl in the match, I’ve never done anything like this, I don’t do any high-flying moves or jump off the top rope,” so I was so nervous. We all knew we had to make something epic so there was another one next year. Not only was there one the next year; there was one the next week. WWE.COM: You may not be a high-flyer, but you had James Ellsworth in your back pocket. Were you thinking about his involvement as you planned a strategy for the match? CARMELLA: Absolutely, I had an insurance policy in James Ellsworth. Everyone else was out there by themselves. They could jump off the ladders all they want, do all the flips and dives, but while they were doing that, I had James. Obviously, he worked in my favor. WWE.COM: After your victory, you faced quite a bit of backlash. How did you deal with all of that coming your way, whether it was on social media or from your fellow Superstars? CARMELLA: I pay it no mind. Everything I do is over the top. When I do something, I want everyone to be talking about it. And that’s what happened – I was trending on Twitter for like three days. I think my strategy worked just fine. I pay no mind to the haters and everyone that doubts me, everyone that was upset about it. I thrive off it. They’re still talking about me, whether they love me, hate me or love to hate me. I don’t care. I’m Carmella — the first-ever Women’s Money in the Bank Ladder Match winner. WWE.COM: Did you revel in sticking it to your haters even more? CARMELLA: That’s exactly what I did. Everyone said I couldn’t do it, that I had to have a man win the first match for me. It doesn’t matter because I won the second one. They said it was because of James Ellsworth, but I didn’t see him on top of the ladder grabbing the briefcase. I grabbed it and I won. I proved everyone wrong, and I shut them all up. I was the first Ms. Money in the Bank, and the second. WWE.COM: Once you had the Money in the Bank contract, why did you wait so long to cash it in? Did you enjoy lording it over the division? CARMELLA: It was great! People said Charlotte or Tamina or Natalya, whoever, was the most dangerous woman in the division, but having that briefcase and contract made me the most dangerous. I didn’t even have to be on TV; I could just sit in the locker room and wait for the perfect opportunity to cash it in. I loved it. I got in Naomi’s head, I got in Natalya’s head, but Charlotte was the perfect choice [to cash in on]. She broke Asuka’s streak; she did the impossible. That means she’s better than Asuka. I cashed in on Charlotte, so that means I’m better than her and I’m better than Asuka. WWE.COM: What about the detractors who think you held onto the briefcase for too long? CARMELLA: I do things on my time. A lot of people were giving me backlash for bragging about being the longest Money in the Bank holder, but my name goes down in the history books. Not only am I the first and second Ms. Money in the Bank, but I’m the longest Money in the Bank holder in history; I beat Edge’s record. The more history we can make — not only me, but the women in general — to hold records is super important. I’m proud of it. WWE.COM: The SmackDown LIVE after WrestleMania, you cashed in on Charlotte Flair. What made that the right moment? CARMELLA: At WrestleMania, there’s so many big moments, and I didn’t want it to get lost. I wanted everyone to be talking about it. The SmackDown after was the perfect opportunity. Charlotte did the impossible and broke Asuka’s streak. The WrestleMania Week crowd is such a special vibe. Plus, my parents and family were there. I wanted them to see it. It was perfect. WWE.COM: Once the referee counts three and you have the SmackDown Women’s Championship in your hands, what’s going through your mind? CARMELLA: All of the hard work that I’ve put in over the last few years. Everything came full circle. I thought about being the last draft pick, not debuting with Cass & Enzo on the Raw after WrestleMania. I thought about everyone doubting me, telling me I’ll never be champion, that I’m just a hype girl. I thought about all of that and … the feeling I had was indescribable. I love proving people wrong. I love doing things that people say I can’t do. I started my journey in NXT four years ago, and now I’m champion. People can complain and say whatever they want, but I’m still the champion. I did it. I’ll never forget that feeling. WWE.COM: You’ve still been dealing with your fair share of detractors on social media lately, including those who think your title win is tainted because of The IIconics’ attack on Charlotte. Ultimately, what do you have to say to those who think you don’t deserve to be where you are today? CARMELLA: At the end of the day, it doesn’t matter what anyone thinks I deserve. I don’t deserve anything; I earn it. I worked hard and put in the effort. People say that I went off what The IIconics did, but that’s what every single Money in the Bank holder did — wait for the perfect opportunity. You don’t just wait for the champion to be up and then have a normal title opportunity. You have to be sneaky. You have to do it in the way that guarantees a title win. I didn’t want to cash in and lose it. At the end of the day, I don’t care what anyone says because I did everything the way I wanted to do it, and I won.